The center of Athens has been experiencing the most painful of its constant mutations, after the social groups that once formed its urban character abandoned it, and those that wanted to benefit from its unplanned, growth-seeking construction left. During the crisis, Athens, and the country as a whole, were left without the safety net of a developed welfare state. Despite the relatively low level of class and ethnic segregation, the center had been facing significant problems well before the onset of the crisis, following a long period of laisser-faire policies in the housing sector, and negligence in urban infrastructure. Starting in the 1970s, the gradual relocation of the upper and middle classes to the suburbs (Maloutas 2013) created amongst those left behind a feeling of entrapment within deteriorating areas. Commercial services also moved to the outskirts, state agencies decentralised, and the least attractive buildings were abandoned, intensifying the degradation that had made the center an affordable option, attracting immigrants in the early 1990s. Although their presence revitalised activities and limited population losses, immigrants became an easy target and were blamed for the deterioration that was actually caused by pre-existing conditions. The crisis intensified the problems, the population became increasingly vulnerable, local resources were limited and/or unused. The research and design project REACTIVATE ATHENS-101 IDEAS developed in a framework consisting of homelessness, unemployment, business closures, and limited or ineffective policies that were employed to face problems and accumulated deficiencies of urban areas. The project was implemented in 2013, in the midst of the crisis; it focused on disadvantaged areas of the centre and crafted proposals for their activation on the basis of an independent, sustainable concept. Its purpose was to introduce new mechanisms and intervention tools in order to apply a model that would enhance the city without excluding people, highlighting diverse local identities and utilising latent dynamics. The project Re-think Athens was a key parameter for this initiative. The intense changes and the reconsideration of mobility patterns in the city center would trigger significant changes regarding the activities and social character of its neighbouring areas. These changes should be properly addressed with regards to their social and economic impact, if to avoid what often happens in large urban interventions (e.g. the Metro), where positive results were awarded to adjacent property owners without demanding compensation for the fact that they significantly benefited from major social investments. The project was funded by the Onassis Foundation and conducted by an interdisciplinary team of researchers and architects under the direction of Alfredo Brillembourg and Hubert Klumpner, directors of the Urban-Think Tank (U-TT) which specialises in social problems of modern cities, and also professors of Architecture and Urban Design at the ETH in Zurich. It developed intensively -for about 10 months- in collaboration with a group of Greek experts, scientists and professionals, with Maria Kaltsa and professor Thomas Maloutas as main advisers in matters of architecture and sociology respectively. This social geography atlas of Athens was part of the wider context of the project. A key aspect of the approach was to search for ideas directly from the people. This task was quite complex, especially because we wanted to reach those who are normally excluded, or often self-excluded due to the lack of information, weakness or burdened by their everyday struggle to survive. The RE-ACTIVATE ATHENS initiative did not have the required time and resources to develop this approach, as this would require the participation of others in the best way possible. 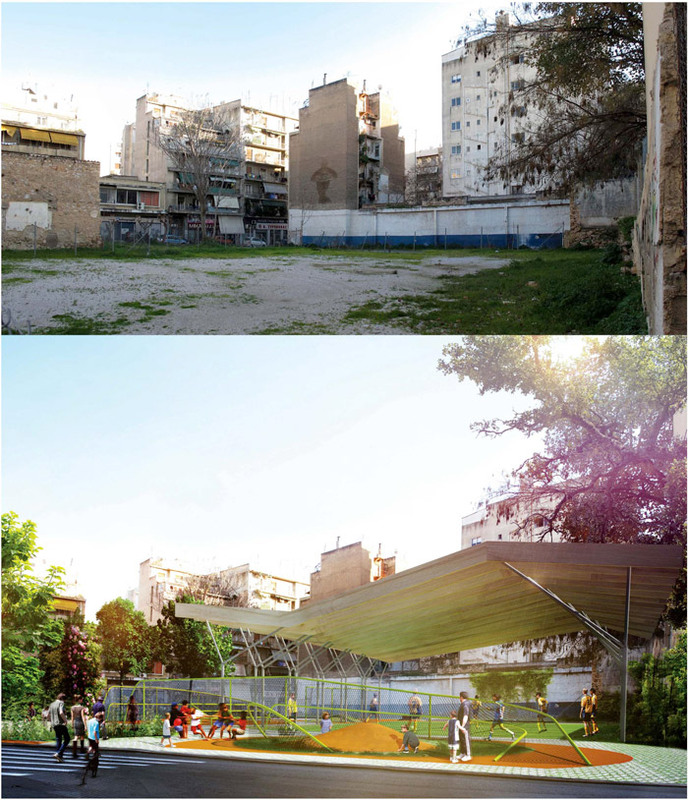 Given the constraints, gathering ideas from the general public was limited to questionnaires on popular websites and magazines, interviews with experts, residents and passers by the project’s offices in Omonia, and special visits to certain central neighbourhoods. Therefore, the participants were not a representative sample of the project’s target group; younger people are overrepresented since they have some knowledge on the issues under discussion and are familiar/have access to means of communication (internet, specific websites, specific press, etc.). However, the response was much higher than anticipated: almost 4,000 people responded to specific questionnaires within two months, confirming what was directly expressed by many participants: the need for the participatory management of local issues. 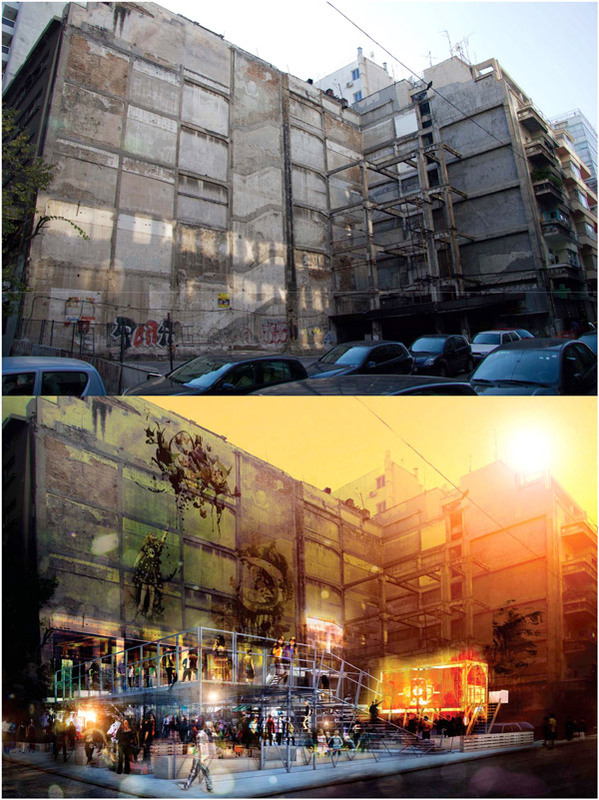 During the project, the open workshop “RA Lab” operated on the unused ground floor of an easily accessible building near Omonia Sq., offered by STASY, and its rehabilitation was funded by the Onassis Foundation. Many workshops took place contributing to the production of architectural proposals; also, 200 interviews with experts and residents, several meetings with research groups, collectivities and NGO representatives in Athens, as well as actions, lectures and eight activation events focusing on the subjects of society, architecture and art, attended by about 1,000 people. The participants’ ideas were often unexpected, inspiring or provocative; processed in inventive combinations by the architects-researchers, they led to the formation of proposals with positive impact on the living standards in the degraded center. Also, 30 general and specialised maps with useful information of sub-regions were created, while an Advisory Committee provided support and information to working groups. RE-ACTIVATE THE ATHENS – 101 IDEAS did not seek to substitute for the institutional local design or authorities, but to provide an alternative point of view for the area’s re-organisation through a documented comprehension of its problems. The study approached the challenges of the city, its contrasts and ways in which it is used, while conducting considerable effort to understand the everyday life of areas and how they will affect and will be affected by a possible local regeneration. A fundamental hypothesis was that a classic approach would not be appropriate for achieving sustainable results and for improving highly problematic areas. Many project proposals were formulated that awaken and challenge conventional planning, offering a visualisation of the approach with examples, and forming an overall roadmap for the next steps to be taken. Some of these proposals are visionary, others acknowledge the broad space between institutional and informal aspects of life by focusing on the diverse groups that reside or work in lagging areas and experience the absolute crisis daily. The proposals highlight how from existing social dynamics, new forms of urbanisation can develop based on new structures, building a new city without displacements, over and within the old city in which traditional and modern activities coexist. The main problem of these areas is the many vacant buildings, the abandonment of private property and the lack of social or political benefits, rather than the quality of public space. The project strategies followed the pattern “identification, response, re-organisation”, while the proposals correlate social and physical planning in order to intertwine daily realities of people who bond in space, and do not live parallel lives that do not intersect. Some proposals are visionary and as such require the right conditions in order to be implemented, but many others concern direct possibilities for interventions of low cost and high impact. 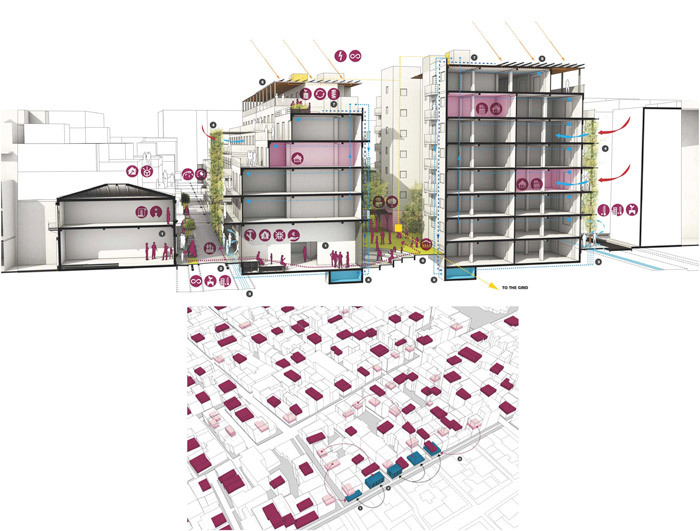 Some proposals which are not expressed in architectural form, mostly seek to functionally combine the available resources and the needs of stakeholders, in order to maximise the use of available resources and minimise needs. Others comprise design solutions, follow the rationale of a more productive organisation of needs and resources, and suggest changes in the building stock and public spaces. The proposals follow the idea of providing reciprocal services to cover all needs. They aim to create such possibilities as spaces for children or skill development and education centers to promote micro-entrepreneurship; they intent to activate public space and use it as a catalyst for the interaction of people with different characteristics, to develop social economy business potential for people, and to propose ideas (historically) identified with manufacturing and crafts production in the center of Athens. 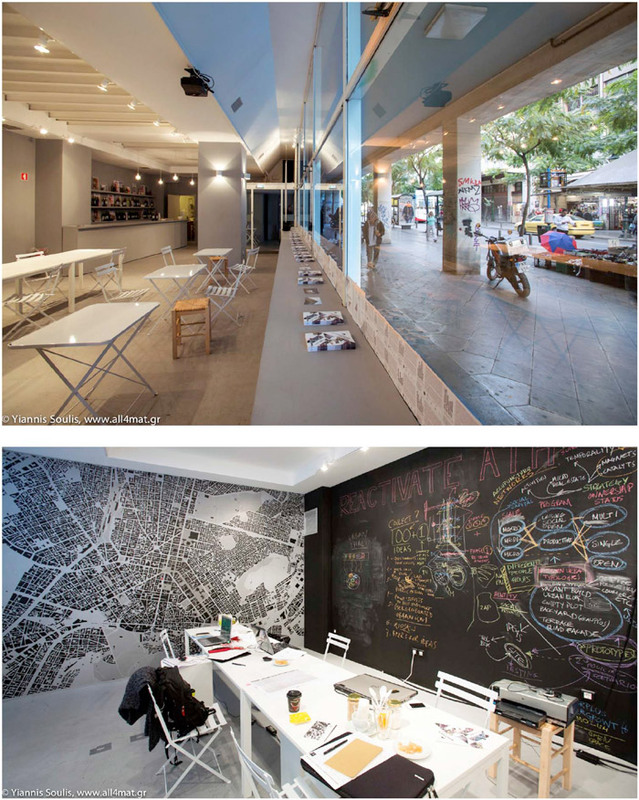 Although many of the suggested interventions and proposals of RE-ACTIVATE ATHENS-101 IDEAS can be realised at a relatively low cost, their implementation is hindered by the absence of appropriate institutions. The development of much needed institutional tools can make their prospective impact possible, while the local government should play a key role in planning and coordinating the implementation of proposals. The almost total lack of governance structures in neighbourhoods means that a crucial link is missing in the realisation process chain of important ideas expressed by this or other similar projects; existing local governance structures are traditionally rather weak and cannot exercise real control over issues such as housing, education or healthcare. Many local authorities have reinforced their activities in the field of social welfare during the crisis, following the dramatic increase of households facing extreme difficulties. However, the lack of financial resources and funds imposes the application of de-commodification solutions that require a degree of independence from the state’s direct financial support, which has, also, always been weak and reduced further due to the crisis. An overview of the project’s proposals reveals to policy-makers alternative ways that can strengthen social cohesion and economic development. This, of course, implies setting clear regulations regarding the rights and obligations of all involved, encouraging bonding solidarity ideals instead of disciplining, meaningful participation at various governance levels, inventive de-commodification where the market cannot or does not perform to yield positive effects, etc. It is imperative to achieve an organisation at the lowest possible spatial level: the proposed solutions will not be viable unless actively adopted by the locals and monitored through local organisational resources. The existing building stock is key for creating affordable housing, and for mandating the types of incentives necessary to attract new businesses in vacant shops and offices. If the right incentives would become available, owners would offer their property for community services (soup kitchens, clinics, etc.). Unemployed tenants could offer social work relevant to their skills and would receive housing and local social benefits in return. Properly organised, effective community work can be an integrating agent for vulnerable groups, and can promote social cohesion while providing a sense of security and belonging for all. 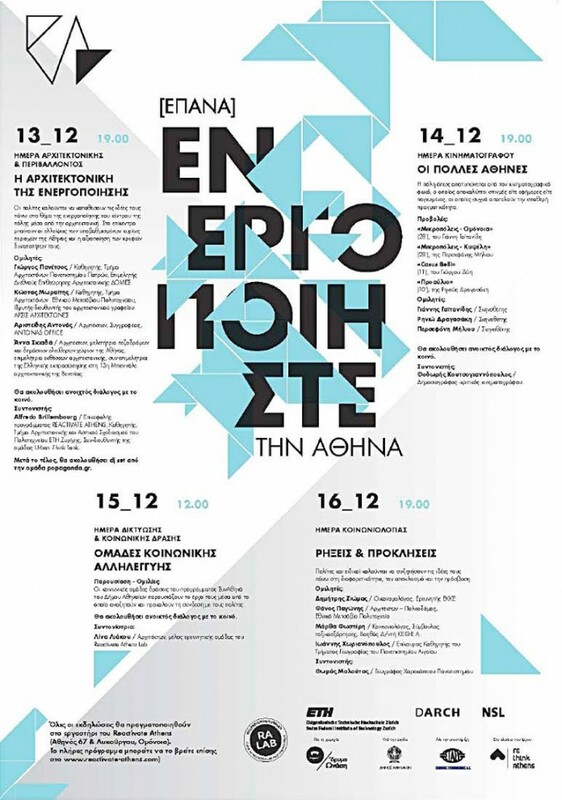 Finally, perhaps the most important idea of RE-ACTIVATE ATHENS-101 IDEAS is the one devising innovative forms of cooperative social housing and social economy by correlating local resources to needs, suggesting arrangements accepted by all parties involved. It would be advisable to inter-connect apartment “cooperatives” in buildings through processing proper organisation and management at block or neighbourhood level, employing the help of the relevant municipal services or central government, as necessary. Inventive solutions offer new types of social housing which are not susceptible to ghettoization and exclusion: these should be functional and appealing to young people regardless of social class, and within areas that are already socially and ethnically mixed. Relations between immigrants and Greeks, and among different ethnic groups, are characterized by both solidarity and tensions; they were undoubtedly better until the first half of the 2000s, when smoother integration opportunities were available for immigrants in the labor and housing markets. The challenge, therefore, is to provide solutions that will stimulate economic activity in ways that will also help tackle social problems and, at the same time find solutions to such social problems that will benefit the economic viability of areas. In the city center, there are many groups and institutions with vested interests in it and in its future. Obviously, they do not share the same interests, views and priorities, and they do not have the same power to impose their agenda or be heard. The absence of structures and of a negotiation culture constitute a considerable difficulty in the effort to find functional solutions for this diverse grid of established interests. RE-ACTIVATE ATHENS-101 IDEAS aimed to bring such vested interests together, and within a framework of mutual recognition, setting particular emphasis on strengthening the most vulnerable actors in negotiation processes. This could not have been achieved in the framework of a short-term project of indicative nature; however, we attempted to have real contact with parties -such as the immigrant communities- that do not usually participate in relevant processes. An important feature of the researched areas is their central location, which could attract residential and commercial uses, and public services. Regardless of local problems, these areas (or parts thereof) are not “grey zones”. The broad center comprises people and activities; thus, the question is not how they will be replaced by other people and activities, but how existing issues will be addressed in socially coherent ways, seeking the active participation of all parties involved. The available building stock is another important resource that requires the invention of alternative, productive arrangements. Public spaces and private, unused open-spaces are also a potential resource. In terms of human resources (unemployed and/or marginalised people, both Greeks and immigrants) incentives can be provided for business initiatives and/or voluntary social work. In the same context, a further resource -the widespread culture of small family businesses and the practical skills of family solidarity- must be supported in order to work for the benefit of the wider society. 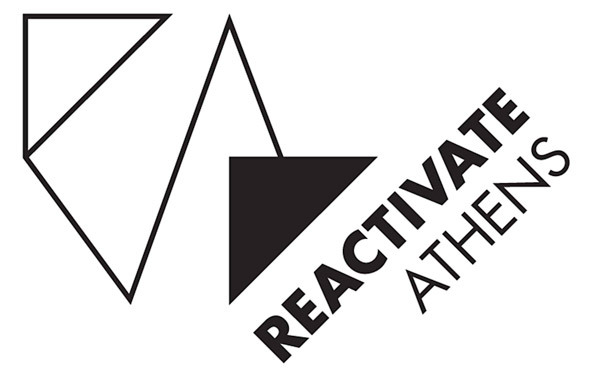 RE-ACTIVATE ATHENS-101 IDEAS gathered a wealth of data that form an important record of views, thoughts and perceptions about the city today. The submitted ideas cover a broad spectrum, ranging from the utopian (visionary concepts trying to promote the Athenian ideal) to the experienced harsh realities of vulnerable groups living in lagging areas, setting basic demands and requesting a better quality of life. The proposed projects combine interventions in space with interventions in the relations of people who live or act in it. We searched for solutions outside the box, making clear that new policies and new ways of governance are required to effectively address problems. Each of the 101 ideas is a key to promote new models of urbanisation that are generated by unconventional approaches, and reflect the people involved, the need to set and follow appropriate processes, and the necessity for institutional help to be provided by the state. The proposals are indicatively visualised. The images serve as examples to arouse interest and make clear that consent and participation are required to achieve the greatest and most critical objectives, which reflect the social approach to the project. The Municipality of Athens, recipient of the deliverables, is the strong institutional body that can make use of the ideas, can promote new policies, and may apply them for the activation of lagging areas, pursuing solidarity and social justice. This will contribute to their strong and healthy regeneration, and to developing a feeling that the city belongs to all residents, cares for them, and provides what is needed to attract their active participation. The final set of ideas is a product of the combined international experience offered by the ETH team, field work and awareness of specific environments provided by the local team, and an apt response of people to our invitation for ideas in the framework of the project. The philosophy of Urban-Think Tank focuses on the need to selectively re-design the urban fabric, and suggest effective solutions for its social re-appropriation. This approach, which is appropriate for cities in both developed and developing countries, justifies the project for central Athens. Under the current socio-economic and political conditions, the vacant building stock and other resources should combine with the skills of local people, in order to make use of resources and ensure their contribution in covering urgent needs. In framing the project, we aspired to discuss interesting ideas and, if possible, to introduce them within an agenda set by a specific perception of expected social outcomes. In this respect, we believe that the project contributed positively to the set tasks. Μαλούτας Θ (2013) Η υποβάθμιση του κέντρου της Αθήνας και οι επιλογές περιοχής κατοικίας από τα υψηλά και μεσαία στρώματα. Στο: Μαλούτας Θ, Κανδύλης Γ, Πέτρου Μ, κ.ά. (επιμ. ), Το κέντρο της Αθήνας ως πολιτικό διακύβευμα, Αθήνα: ΕΚΚΕ, Χαροκόπειο Πανεπιστήμιο, σσ 29–51. RA Lab (2016) Reactivate Athens-101 ideas. Αθήνα: Ίδρυμα Ωνάση.